#1. This week's number one is an international guard Emmanuel Mudiay (196-96, currently plays in NBA). He led New York Knicks to a 2-point victory over the Milwaukee Bucks (15-7) 136-134 in the NBA in Saturday night's game. Mudiay was MVP of the game. He recorded 28 points (!!!) and added 7 passes in 36 minutes on the court. The New York Knicks have rather weak 8-17 record this season. But this is still an early stage of the season and everything may happen. It's Mudiay's first year with the team. Mudiay has individually a very good season with high stats. He averages: 11.7ppg, 2.9rpg, 2.6apg, 2FGP: 51.7%, 3FGP: 35.8% and FT: 72.7% in 18 games he played so far. Mudiay played for the DR Congolese senior national team one years ago. #2. Second place goes to an international guard Mathieu Kamba (196, agency: Dynamics Global Management, college: Cent.Arkansas, currently plays in Spain). 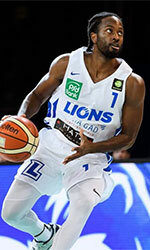 Kamba was the major contributor in Araberri's surprising victory against the fourth-ranked RETAbet BB (8-3) 77-76 in the Spanish LEB Gold (second division) on Tuesday night. He recorded 21 points, 4 rebounds and 3 assists in 26 minutes; not bad, considering it's only Kamba's first season in pro basketball. Saenz Horeca Araberri (5-6) is placed 13th in the LEB Gold. It was his team's fourth consecutive victory in a row. But the season is still in it's first stage and everything can happen. It's Kamba's first year with the team. He has relatively good stats this season: 12.8ppg, 3.5rpg, 1.6apg, 2.0spg, 2FGP: 53.9%, 3FGP: 24.0% and FT: 71.1% in 11 games. Kamba has a dual citizenship: Canadian and DR Congolese. He is in the roster of the DR Congolese senior national team. #3. The DR Congolese player who performed third best last week abroad was an international forward Jonathan Kasibabu (203-96, currently plays college basketball in the States), who plays in the NCAA. He could not help the Fairfield to beat the U.S.Military Academy. Kasibabu scored 7 points. his team was edged 63-60 at home by the U.S.Military Academy. Kasibabu is one of the most experienced players in a team as it's his fourth year in Fairfield's roster. His overall stats this season are: 9.4ppg, 5.1rpg, 1.3apg, 1.1spg, 2FGP: 55.6%(20-36), 3FGP: 25.0% and FT: 68.4%. Kasibabu is also a member of the DR Congolese senior national team. #4. Power forward Jonathan Malu (200-93, currently plays in Germany) was not able to help Artland Dragons in their game against Walter Tigers (6-6) in the German ProA (second division). He scored only 4 points in 13 minutes. Artland Dragons was badly defeated 99-79 on the road by the higher-ranked (#8) Walter Tigers. It was Artland Dragons' third consecutive loss in a row. It's Malu's first season with the team. This year Malu's overall stats are: 3.4ppg and 1.5rpg in 11 games. He is another player who holds two passports: DR Congolese and German. Malu is also DR Congolese national team player. #5. Former U18 international forward Patrick Mwamba (196-99, currently studies in the States) was not able to secure a victory for the Texas Arlington in their game against the The University of Tulsa in the NCAA. He cannot count Tuesday's game as one of the best ones. Mwamba recorded only 3 points, 4 rebounds, 3 assists and 3 steals. his team was defeated 72-58 on their home court in Arlington by the The University of. Mwamba's total stats this season are: 5.2ppg, 2.5rpg and 1.5spg. He used to play for the DR Congolese U18 national team two years ago. #6. Center Gullit Mukendi (203-96, currently plays in Spain) couldn't help Azuqueca (6-5) in their game against L'Hospitalet (5-6) in the Spanish LEB Silver (third division). He cannot count Saturday's game as one of the best ones. Mukendi scored only 2 points. The fifth-placed Azuqueca (6-5) was edged 79-76 on their home court in Azuqueca by the lower-ranked L'Hospitalet (#9) in the East group. Mukendi's total stats this season are: 4.2ppg and 2.5rpg. He is an international player who is currently on the senior DR Congolese National Team roster. #1. Nicola Akele (203-F-95, college: Rhode Island, currently plays in Italy) led Roseto Sharks to a victory over the eighth-ranked Orasi RAV (5-5) 91-80 in the Italian Serie A2 (second division) last Sunday. He was the best player in that game. Akele recorded a double-double by scoring 34 points and getting 10 rebounds; quite an impressive performance considering it's only his first season in pro basketball. Roseto Sharks (3-7) is placed 13th in East group. It was his team's third consecutive victory in a row. But the season just started, so everything may happen. It's Akele's first year with the team. Akele has relatively good stats this season: 14.0ppg, 5.8rpg and 1.1apg. He has a dual citizenship: DR Congolese and Italian. Despite Akele's DR Congolese passport, he previously played for the Italian U20 national team and is probably not eligible to play for the DR Congolese team. #2. David Kapinga (180-PG-95, college: Union, KY, currently plays in Canada) was the major contributor in an University of Calgary's victory against the Pronghorn (4-6) 95-90 in the U Sports in Saturday night's game. Kapinga scored 23 points, made 3 passes and 3 steals. The University of Calgary has quite an impressive 12-0 record this season. So far his team won all twelve games in the Regular Season. Kapinga is one of the most experienced players in a team as it's his fourth year in University of Calgary's roster. This season he has relatively solid stats: 13.2ppg, 3.6rpg, 3.9apg and 2.8spg. Kapinga is another player who holds two passports: DR Congolese and Canadian. #3. Joel Ntambwe (206-F, currently plays college basketball in the States), who plays in the NCAA could not help the UNLV to beat the University of Cincinnati. He scored 7 points in 16 minutes. his team lost 61-65 on the road to the University of. It's Ntambwe's first season with the team. This year Ntambwe's overall stats are: 5.0ppg and 2.6rpg in seven games he played so far. #4. Hugues Mbumba (201-F/C, currently plays in NCAA2) contributed to an easy victory against the Oakland City University 82-63 in the NCAA2 on Tuesday night. Mbumba scored 6 points and grabbed 4 rebounds in only 14 minutes. It was the game of the round between two top 4 ranked teams. The University of Southern Indiana has record this season. This year Mbumba's total stats are: 5.0ppg and 2.5rpg in two games. #5. Eliel Nsoseme (206-F/C-97, currently studies in the States) faced previously mentioned Joel Ntambwe in the NCAA last game. Nsoseme managed to help University of Cincinnati in a victory against the University of Nevada - Las Vegas 65-61. He scored only 3 points, grabbed 8 rebounds and made 2 blocks in 18 minutes. This year Nsoseme's total stats are: 2.3ppg and 4.4rpg in eight games.